Volume Discounts & Loyalty Privileges Silver Jewelry Program. Wholesale Prices! "Volume Discounts & Loyalty Privileges" is a new and exciting sales program developed to reward all our customers, from individual purchases to retailers, with big cash discounts for their continuing loyalty. From the very beginning all our clients, whether big or small, will make instantaneous cash savings of up to 25%. In addition, each time you visit and make a transaction your purchase value will be accumulated over a two-year period. This process of accumulating your purchase values will further increase your cash savings no matter what the size of your transaction! Later, if you have reached an accumulated purchase value of over $1000 you will get a ‘Loyalty Privileges’ 10% off regardless of transaction size. However, if you qualify for both ‘Volume Discounts’ and ‘Loyalty Privileges’ we will honor the higher discount rate. 1. This transaction qualifies for a 5% Volume Discount. 2. The $285 is accumulated. The transaction qualifies for a 10% Volume Discount. becomes the default level of discount. 4. The $1,095 is accumulated. The transaction qualifies for a 15% Volume Discount. becomes the new default level of discount. 6. The $2,880 is accumulated. The transaction qualifies for a 15% Loyalty Privilege. 1. 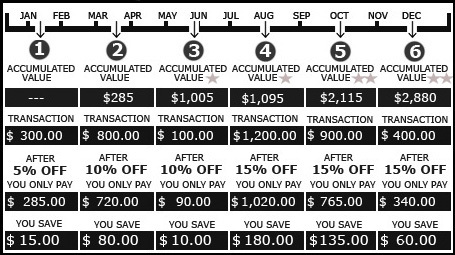 The net purchase value is the net product value after discount. 2. The accumulated purchase value will be accumulated for 5 years period. 3. The purchase value will be accumulated/updated on the 15th and 30th of each month. 4. The 'Loyalty Privileges' will expire if the customer makes no other transactions within 1 year. the highest discount level will be honored. 6. Clearance and other discount items are excluded from this program. 7. Free gifts are not given within this program. 8. Other promotional codes cannot be used within this program. 9. The discount value will be deducted from total product value. 10. Shipping, insurance and sales tax will not be discounted. 11. Excessive returns will be charged a 15% restocking fee. 12. The value of the return will not be included for discount point. items purchased from third party websites. 14. This promotion is not applicable through referrals from third party websites.